Happy February everyone! Taking this Valentine's Day way back into the early 90s with these hanging window hearts. 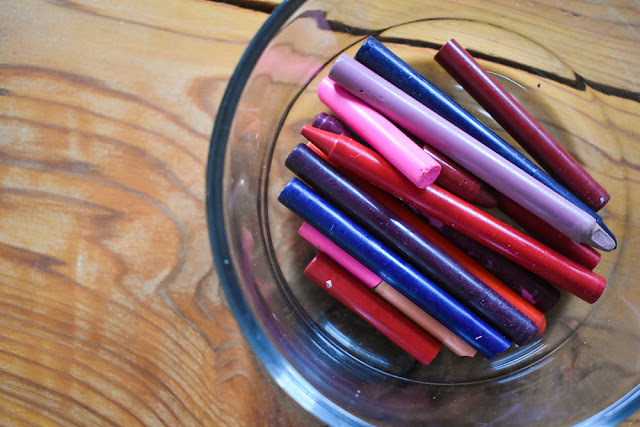 Did anyone else melt crayons between wax paper with their parents during the holidays? My mom definitely did this with us during the fall and we would use fall colours and cut out leaf shapes to hang in the windows. I know that most of us don't decorate for Valentine's Day, but that's also a huge childhood memory for me. My mom decorated for every holiday, even if it was just a little bit. It made each holiday feel so much more special. Eli is still a little young to appreciate the holidays, and definitely not participating in crafts yet, but I figured I should get in the habit if I want these special holiday traditions to live on. 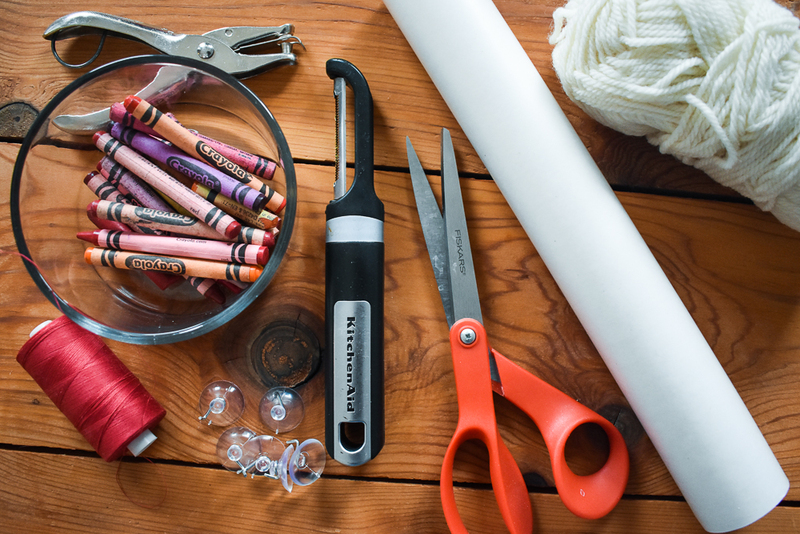 And this craft is definitely kid friendly, not just for the adults. My biggest holiday goal is a quilted couch throw for every holiday excluding the minor ones. But that's for future Katie to contemplate. 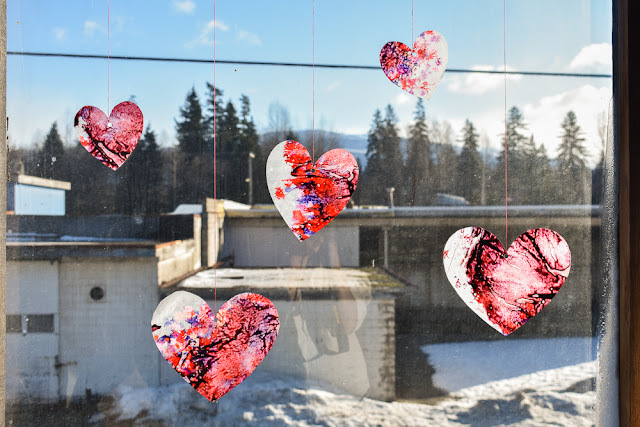 Here's what you'll need to make these hanging window hearts. * Crayons in Valentine's Day colours (or really whatever colours match the holiday or cut outs you're planning on doing). * Scissors or a peeler to shave the crayons down and then to cut your shapes out afterward. * Window suction cups . 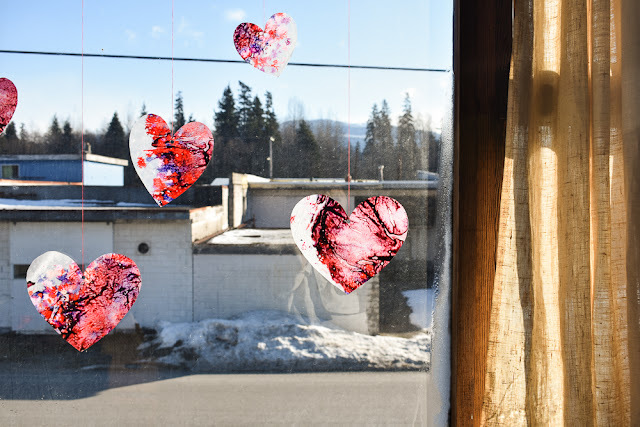 * Thread or yarn to hang your finished window hearts. * An iron and ironing board (not pictured). 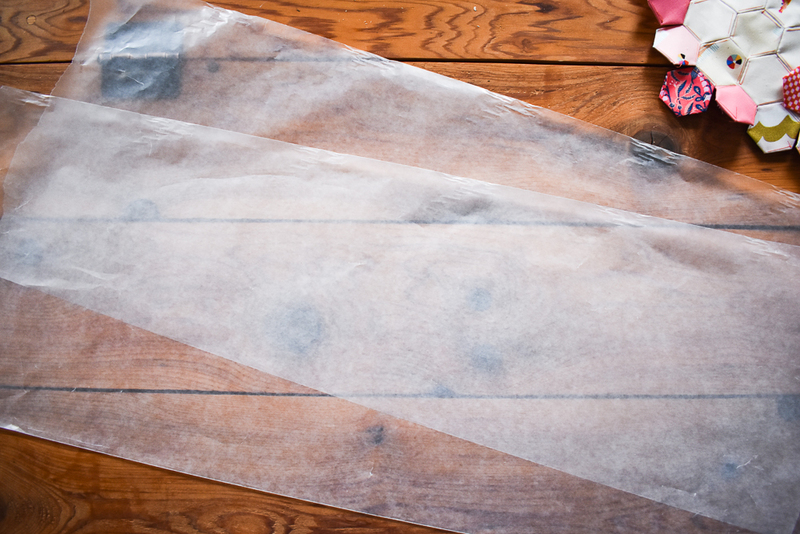 Step 1: Cut out two long sheets of wax paper. Step 2: Remove the wrapping on your crayons and gather coordinating colours. 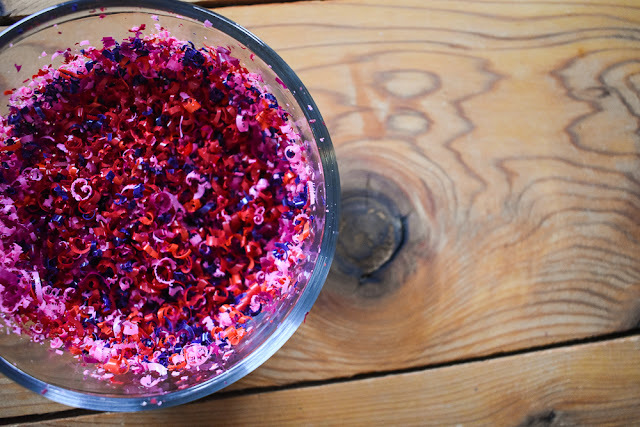 Shave your crayons down with scissors or a peeler into a container either dividing your colours (if you want solid colour hearts) or mixing them in one container. I found it easiest to use scissors to do this. Step 3: Move one piece of your wax paper to your ironing board and spread your shaved crayons all over the wax paper evenly. Then lay your second piece of wax paper over top of your crayon shaving and line it up with your first piece of wax paper. Your basically sandwiching the crayon shavings between the two pieces of wax paper. Step 4 (the fun part! ): Make sure everyone has a good view for this. Iron the two pieces of wax paper together. 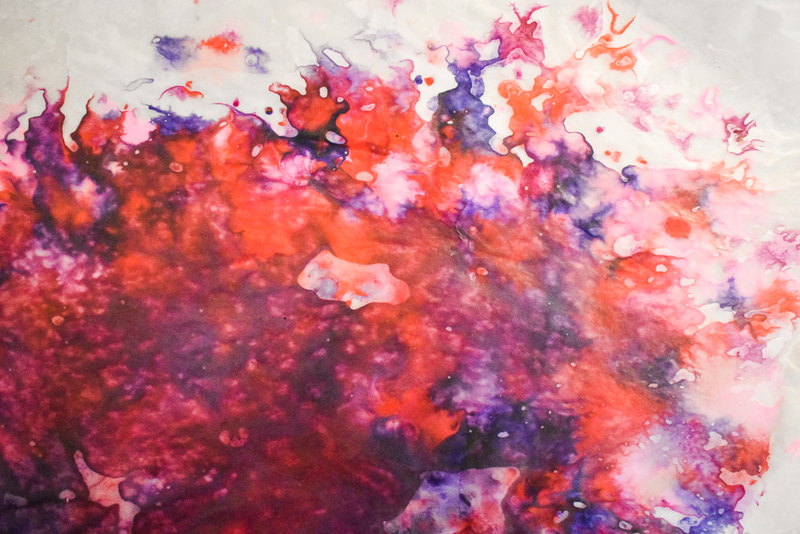 The crayon wax will melt in between the two pieces and start to spread out like paint. You can use the iron to direct colours in different directions. Be warned though, if you do a lot of ironing the colours blend too much and you basically end up with brown. 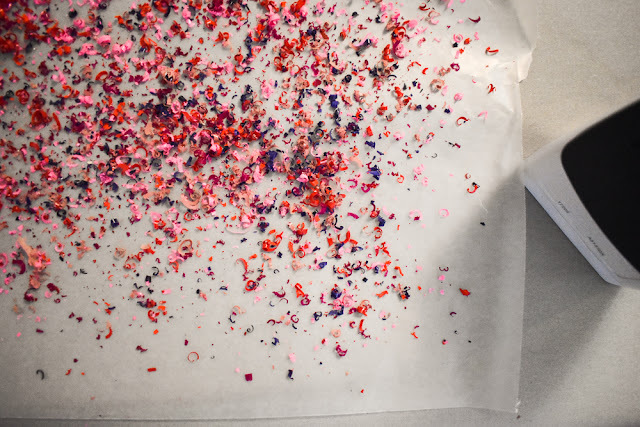 Step 5: Give your colourful wax paper a few seconds to dry and then, either free hand or using templates (I used templates) cut out your hearts. I cut mine out in 3 different sizes. Wipe down your window and place your suction cups evenly spaced apart. 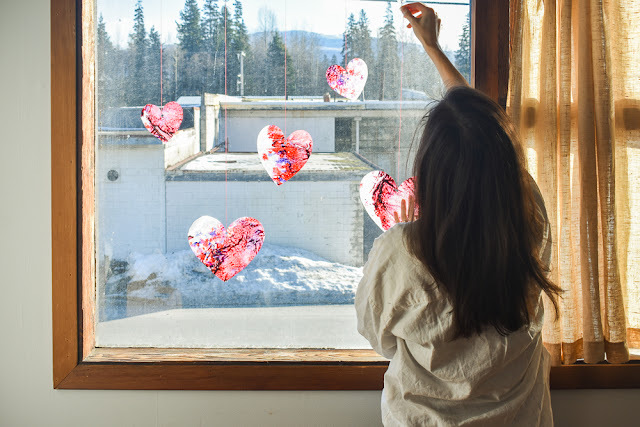 Hole punch your hearts just below the center where the two sides of the heart meet and fasten long pieces of thread or yarn to each to hang off of your window suction cups. I love how they turned out. 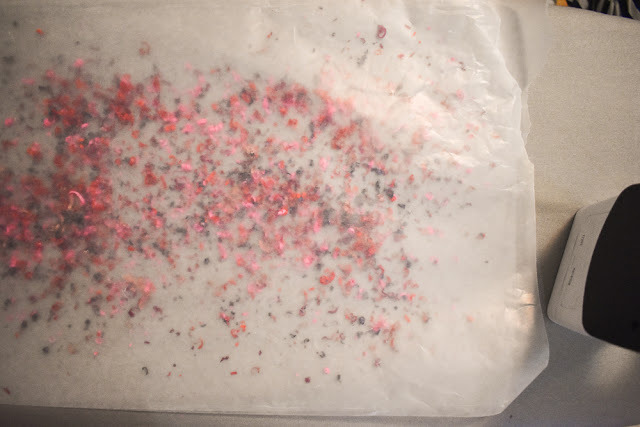 I also cut them out along the edges of the wax paper where the wax crayon stops and the plain wax paper starts. I feel like this helps the hearts really catch the light. They almost look like stained glass in the window on a sunny day. I hung these in two windows in my living room. What do you do to celebrate Valentine's Day?